Most people would have thought the first electric tram route would have run down a Melbourne CBD street and are surprised to find that it actually ran between Box Hill and Doncaster. 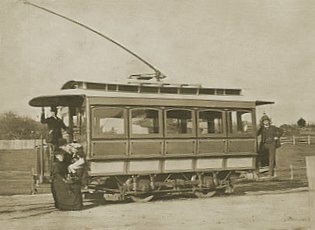 From October 1889 until January 1896, an electric tram ran between the Box Hill Post Office, on the corner of Whitehorse Road and Station Street, across the paddocks, over Koonung Creek and up to a terminus near the intersection of Elgar and Doncaster Roads, Doncaster (approx 3.5km/2.5 Miles). At the Doncaster end was the famous 285 foot high Doncaster Tower which attracted thousands of visitors for its awesome views. 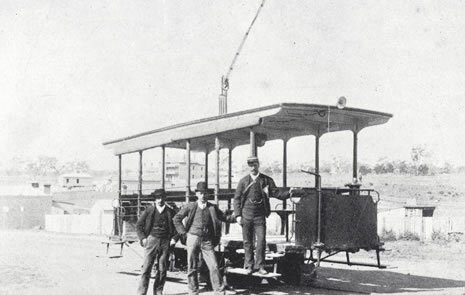 It was the first electric tram in Australia, and the southern hemisphere, to operate as a regular service and ran along Station St and Tram Road. The origin of the Box Hill-Doncaster electric tramway dates from the Centennial International Exhibition held at the Exhibition Buildings in 1888-89. Among the attractions nearly 17,000 passengers travelled along a 300-yard track at threepence per ride on a working electric tramway exhibited by W.H. Masters and Company. The Box Hill and Doncaster Tramway Co Ltd was formed and cut the route through undulating farmlands which lay between it and Box Hill. Idyllic. Perfect. That was the belief and the intention, but amongst those people to the north, past whose land this tram was to run, were many who regarded it as far from idyllic and far from perfect. They saw it as an intrusion, as the brainchild of money - the city and its people left right back where they belonged. They resented closer settlement and earnestly feared this boom which had so disturbed the pattern of their lives. They resented the sightseers who so often were wantonly destructive. They resented the drunkenness and the vulgarity of day trippers. They were not arrogant or un-Christian, or did not mean to be. They merely wished to protect the sanctity of their homes, and the men who had risen up and burnt the Empress of India to the ground, again rose up and fought the tramway every foot of the way. When words failed, they turned to force. They ploughed in with their fists and drove the workmen away. They tore up the tracks bodily until the Company demanded the protection of the Law and was given it. So it was, that in time, after almost two years of bitterness, violence and widespread ridicule, the tracks, the overhead line and the powerhouse were completed; the Box Hill Terminus was Silas 'front door; and the Doncaster Terminus at the junction of Williamson and Elgar Roads. The farmers, however, even if they accepted the unavoidable, remained unappeased and it was only before the courage of the company and the threat of the law that they had bowed. The formal opening on the 14th October 1889 was impressive and happy enough. All unpleasantness seemed to be forgotten; the mockers were there with the supporters, Members of Parliament with Councillors, those who had fought it with those who had made it. For a while, the little tram met every train, day in, day out; but soon tempers again ran short. Sabotage, as irresponsible as the vandalism which the farmers themselves deplored, was resumed. The farmers retaliated with a wrong as great as the wrong they sought to right, and all lost. Everyone. The tram ran for several years, without accident of any kind, but meanwhile the first company failed, a second company failed and H J Hilton, single-handed, operated, maintained and drove it for eighteeen months until January 1896. Hilton's achievement was prodigious, and richly deserved the support of the wealthy residents of Doncaster, but this they resolutely refused to give. In the end there was nothing. The 2 pictures show considerably different trams (one open the other enclosed). The picture above from the book "A Tale of Box Hill" also includes a reference to the 2 storey house in the background as the residence of Thomas Cook. 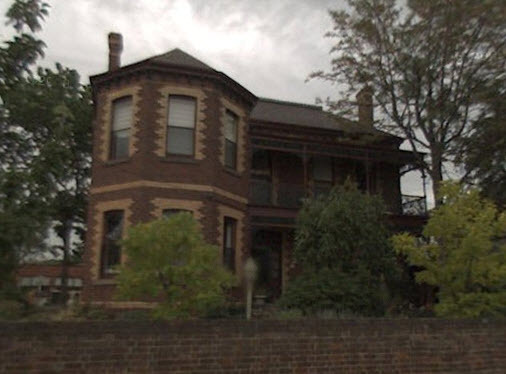 At the time of writing (1957) it still stood in Watts Street, Box Hill. This pic "may' be it.